"Harpers Ferry, West Virginia. View of town; confluence of Potomac and Shenandoah rivers; railroad bridge in ruins." 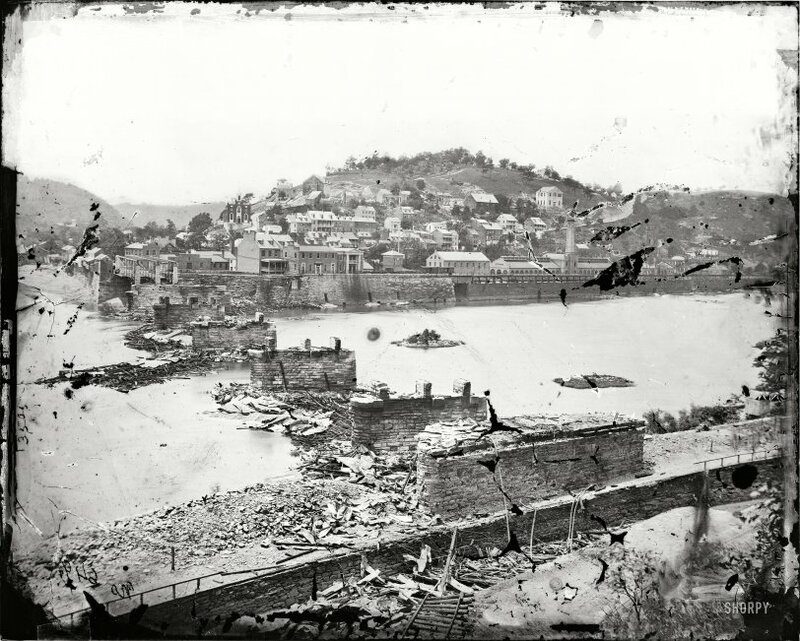 Battle of Harpers Ferry, September 1862. Wet plate glass negative by C.O. Bostwick. View full size. Submitted by Hilbert on Thu, 01/20/2011 - 5:17pm. It never ceases to amaze me how much destruction there was of infrastructure during the Civil War. Cannons were somewhat primitive back then and they took considerable time to reload - (hardly WWII 88 or 105mm class), so the amount of time knocking things down or blowing them up seems somewhat inordinate. It's as if the pillagers almost enjoyed their vandalism. Submitted by Andy Hall on Mon, 08/02/2010 - 11:00pm. The long industrial buildings at right along the river are the U.S. Armory, principal objective of John Brown's raid in 1859. Just to the left of the remains of the railroad bridge on the opposite bank, you can see a building extension built out over the river. This was almost certainly a toilet facility (similar to a medieval garderobe), built out over the retaining wall to empty directly into the river below. How did you know I was going? Submitted by Kilroy on Mon, 08/02/2010 - 3:02pm. I'll be taking the family there this coming Friday for a camping trip to see Harpers Ferry and then the Antietam Battlefield. I think they destroyed and rebuilt this bridge about five or six times during the Civil War. Submitted by Scotsheart on Mon, 08/02/2010 - 12:48pm. OK, very funny, who took the bridge down? Submitted by Mr Mel on Mon, 08/02/2010 - 12:19pm. The faults and scratches on the almost 150 year old negative just enhances the destruction. Great picture, we should all be grateful that these pieces of history are available. Submitted by Anonymous Tipster on Mon, 08/02/2010 - 11:23am. Destroyed and rebuilt something like five times during the war. Finally washed away by a flood in 1936. Submitted by Gooberpea on Mon, 08/02/2010 - 11:18am. The hill at the extreme left in the photo was the location of one of Stonewall Jackson's artillery batteries that shelled Harper's Ferry and forced the surrender of 12,000 Union troops garrisoned in the city. Col. Dixon Miles, commanding the Federal troops, was killed after he negotiated the surrender by a last salvo fired from Loudoun Heights. After paroling the Union prisoners of war, Jackson and A.P. Hill marched their troops to Sharpsburg, where they arrived just in time to turn the tide of that battle and save Gen. Lee from near defeat. Submitted by Anonymous Tipster on Sun, 08/01/2010 - 3:37pm.